Last weekend, we got a new printer. It’s one of those fancy-smancy ones that print, scan, fax and feed the dogs. Shaun has always said we’d never get on of those all-in-ones because they are all basically worthless. He would know because he works in the printing and imaging group. Or did….or…oh whatever. Anyways, we needed one right away so that the girls could print out their school assignments. (Teachers are so picky about wanting things turned in on time) Shaun brought this one home, dropped it off by the kid computer and went into the dungeon his office saying that he needed to check his work email real quick before he could set it up. Real quick soon turned into a couple of hours. It seemed that WoW had done some sort of update and his guild really, really needed him to play. The guilt of a family really, really needing a printer finally got to him and he grudgingly set it up. (In all honestly, we were trying to do it ourselves but it seems that my inept technology gene has been passed down.) Of course it was a piece of cake for Shaun and worked perfectly. Only, I later found out that our new printer only worked if you were trying to print from the girls’ computer. If I wanted something printed I had to email it to one of the kids and have her print it for me. I started to nag gently requesting that my Beloved fix this problem for me. Naturally, Shaun agreed to fix it…just as soon as he was done with whatever he was doing. I finally came up with a plan. 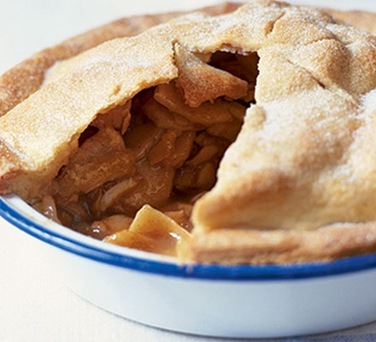 Knowing that Shaun had a craving for some apple pie (He’d only asked me to make him a pie about a zillion times) I sent him a simple email noting how very, very sad it was that I couldn’t print out a recipe to make pie crust because I had no access to the printer. Now why didn’t I ever think of using bribery sooner? This isn’t the pie that I made. That one disappeared almost instantly. Ummm, Ymmmmm . That looks so good and I say….what ever works do it Girl!!! You are a brilliant woman! That pie looks good. Bribery works so well! I am a big fan of Parenting Through Bribery and Making Married Life Easier Through Bribery. A solution where everybody is happy at the end is always a good thing. Wannabe~Thanks…but you should’ve seen the one that I made! Heather~ (I’m so impressed that we are now on a first name basis!) Thanks for calling me brilliant, now my head will just float all day! Peggy~I’ve known about the parenting through bribery, but for some reason the marriage idea bypassed me…until now that is! Shaun~ Um….does ANYONE know what he’s talking about ? Pie…smacks forehead with hand! Now why didn’t I think of that. Hubby loves his blueberry pie, I would love the hole in my basement ceiling fixed. I think I see the start of a beautiful thing happening here! And with this secret revealed, the whole world shall be yours! Mwahahaha! Tooo funny! !, I will have to try that one……Hmmmm. What a brilliant . . . and hilarious . . . solution. Next, I want to conquer downloading photos. I’ve been working in Kodak Gallery, but it’s too tedious. I’m trying to learn Picasa. At any rate, Brava on the printer (and the pie)! Jay~You head on over and I’ll start my To-Do list and run to the store for some ice cream. Joy~Just think of all that can be accomplished with a simple baked good! Tink~Aren’t you lucky to learn this right before you get married? Newfarmlife~let me know if it works! Ruth~I just with I had thought of it sooner. Kathy~I don’t think you understand exactly how steep my learning curve is! Post your blog URL in the little box and I’ll come visit you! You are one smart cookie. Or pie. Or whatever. I’m totally going to use this trick, or something like it. Very clever idea. I might just have to try that one. I have that same inept technology gene; maybe we are long lost relatives;-). I love apple pie. Lisa~You know…I’ve noticed that the “feed dog” feature really doesn’t work all the great. It helps it you look at a kid, pretend it the printer and tell it to go do it. Now scribbling a mental note to try this when I need something fixed. I’m so inspired! My husband loves some apple pie too. Hmm. What can I get him to do for me? Thanks for the idea!! Yes! I laughed out loud inspite of thinking that the Universe had provided me an answer to getting my new printer working properly. It won’t print my emails… the other one does. But I can’t bribe anyone with apple pie, as he is at this moment down stairs making one of several Christmas cakes, and prides himself on being computer illiterate. Hope you found something useful to you in my blog.